Seafolly "Bali Hai" swim top in floral-print microfiber. Bandeau neckline with horseshoe notch at center front. Halter straps can be tied at center or around neck. Soft cups, boning, and gripper tape. For in-store inquiries, use sku #2466824. Carmen Marc Valvo tankini top in solid microfiber with bead details. Bandeau neckline. Detachable halter strap. Cutout back detail. Ties at mid-back. Nylon/spandex. Hand wash. Imported. Please note: bottoms sold separately. 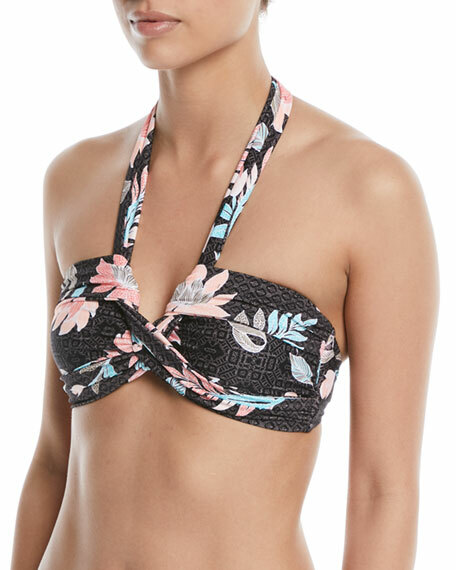 Diane von Furstenberg bikini top in floral-print microfiber. Bandeau neckline; center O-ring detail. Detachable halter strap. Clasps at mid-back. Silk/cotton. Hand wash. Imported. Model's measurements: Height 5'9" / 175cm, bust 32"/81cm, waist 23"/58cm, hips 35"/89cm, dress size US 2. Diane von Furstenberg demi-cut bralette swim top in printed microfiber. Quick drying, four-way stretch, & UPF protection. Molded cups and underwire for added support. Sweetheart neckline. Optional spaghetti straps. Back hook closure. Nylon/spandex. Machine wash. Made in USA.